Newspaper and other stories, facts, and statistics showing common types and causes of injuries in the home and in the workplace, and how these injuries could be prevented. Newspaper and other stories , facts, and statistics showing common types of crimes and ways to avoid being a crime victim. Facts you have obtained concerning the frequency of accidents and of crimes in your local area. A paragraph or more, written by you, explaining how a serious fire, accident, or crime could change your family life. 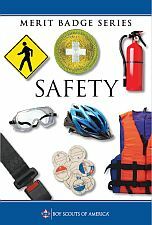 A list of safe practices and safety devices currently used by your family, such as safety practices used while driving or working and safety devices that prevent injuries or help in an emergency. Show your family the exits you would use from different public buildings (such as a theater, municipal building, library, supermarket, shopping center , or your place of worship) in the event of an emergency. Teach your family what to do in the event that they need to take shelter in or evacuate a public place. Make an accident prevention plan for five family activities outside the home (at your place of worship, at a theater, on a picnic, at the beach, and while traveling , for example). Each plan should include an analysis of possible hazards, proposed action to correct hazards, and reasons for the correction you propose in each plan. Plan and complete a safety project approved by your counselor for your home, school, place of worship , place of employment, or community.